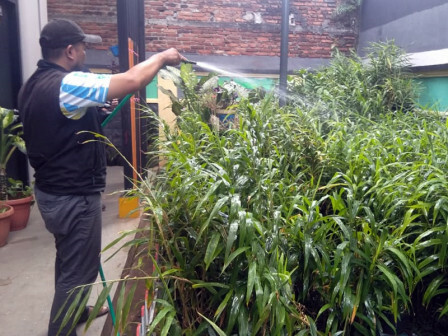 A community group in Central Jakarta has transformed a 32-square-meter width land in the Rasela Indah child-friendly integrated public space (RPTRA), Jalan Rawa Selatan II, Kampung Rawa Urban Village, Johar Baru, Central Jakarta into a cultivation of red ginger.
" After that we try to sow red ginger seeds in 70 polybags"
Rasela Indah RPTRA Caretaker, Budi said that it began when the training of red ginger cultivation held by one of the herbal beverage companies last September. It is also fairly easy, as the seedlings which have been sown and planted in polybags only require treatment in the form of nutrient water or liquid fertilizer once a week. "For its treatment we just do the dried leaves cutting," he told. The harvest occurs after the seeds are nine months or June. Predictably with the price by Rp 40,000 per kilogram, he could make earnings at least Rp 2.8 million. "Its proceeds will be used to increase the financing of a variety of purposes parks," he stressed. As for the information, the park also planted family medicinal plants (Toga) and heartleaf maderavine madevin (locally known as binahong).